We’re almost half way into January and I’ve finally decided to do a post on what I got for Christmas! Why the delay you might be asking? Well, I got money from my Dad & Step Mum because I wanted to buy a new purse…but could I decide which one to buy? Nope. Not for weeks. So now that my beauty has arrived, I can give you a full show of what I got. We did our Christmas early as we like to do it when there is just us and we were going to Kent to spend Christmas with my family. 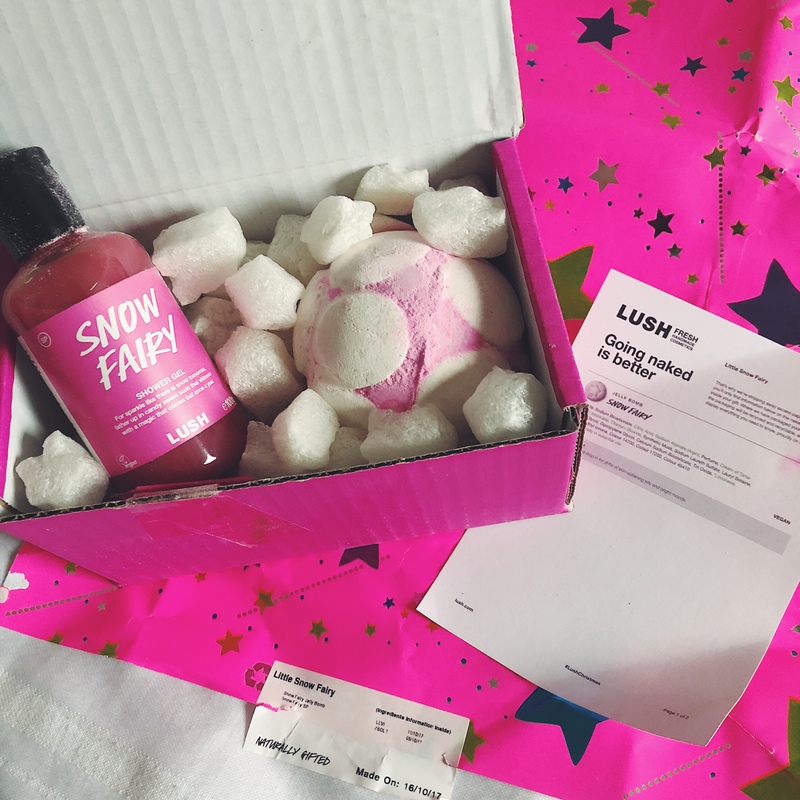 A Snow Fairy gift set from LUSH. Any girl’s dreaaaam present at Christmas time! I’d actually asked for one of these and he chose this one himself and I was so impressed. I LOVE this so much as you can monitor your daily water intake, theres a doodle space, there’s even a habit tracker AND IT HAS FLAMINGOS ON! If you love G&Ts as much as I do, you’ll know how happy I was to receive this! All the gins and all the tonics, yes please! This went down a treat over the festive period! I’d wanted an off-shoulder knit for such a long time and was so happy when I unwrapped this! It’s beige in colour, chunky knit and so warm and snuggly. A voucher for my fave brunch place! I mean, could this boy do any better?! Again, lovely, bubbly & was consumed over the festive period! Ohhhhh myyyy goshhhh! This boy is full of surprises, honestly. I was so excited when I unwrapped this and kept saying ‘omg’! In the Acne Studios classic pink colour, it’s the perfect winter warmer and I literally haven’t taken it off since! Honestly so obsessed with this! I love all things TWC and Seychelles is my favourite scent that they do, too! This is one of those gifts though that I can’t wait to use but at the same time wish I could keep it forever and just look at. Does anyone else get like that sometimes? Or is it just me?! I’ve secretly wanted one of these jumpers for about 2 years and now I have one! Eeeeek! The excitement is real! They are ridiculously priced and not something I would ever purchase myself, but to receive as a gift I was sooooo incredibly happy! Naturally I put it on straight away and made it my Christmas outfit, I mean it would be rude not to have, right? Anyway, I got the red one with the leopard print star on – just like Megan Ellaby! So that was a great choice by my mother! I loveeee the glitter lining to this set, it’s so cute and different to the standard CK sets you can get. The bra is obviously shaped and not sports-bra-ish and it does up at the front which is nice and different, too and the knickers are high waisted too. This is a size extra small and fits perfectly. I love Fearne Cotton’s book, Happy, so when she made the Happy Journal I wanted it too. It’s super cute and a lovely way to offload and write down how you’re feeling. Each day prompts a topic for you to write about and there’s a face which you finish with how you’re feeling. I love itttt. This is the cutest gift I’ve ever received. I loveeee it so much. From my Nan and Gran, we got couples vouchers for both Next and House of Fraser which is great as we love (well I love) buying stuff for our flat. So both of those vouchers will be used on home accessories. well I opted for the Gucci Marmont Purse in Pink and IT’S LOVE. I’d wanted a smaller purse as I always use small bags, other than for work really, so I got this one. It’s like a little wallet, with 4 card slots, a zipped coin compartment and a notes section on the side. I also got some smellies, a whole gift bag full of chocolate, a Jemima Puddleduck Plush (my absolute favourite from a child) and a Christmas lottery ticket (I didn’t win though, sadly)! So yeah, that’s pretty much everything I got. I am one lucky girl. What’s your favourite thing(s) out of everything that I got? I’d love to know so go ahead and leave a comment at the bottom of the page!